Writing with a Mark Twain Crescent Halloween Fountain Pen, you shall become as adept at storytelling in your writing as he. I do believe! It is not unusual for a writer to have a favorite pen with which to write a masterpiece. I have long been on the lookout for that essential tool for myself and I have finally found it. I discovered the Conklin Mark Twain Crescent Halloween Fountain Pen just in time for writing haunting tales for the All Hallows seasonal festivities. Perhaps you are a reader, not a writer. No problem, as surely you know an author friend or family member or two who would be thrilled to receive one of these fountain pens, not just as a gift in itself but as a token of your support and encouragement of their individual writing style and storytelling talent. So if you don’t want to purchase one for yourself, buy it for them, or for me! Conklin Crescent collection pens are exact reproductions of original filler fountain pens used and endorsed by Mark Twain. The Crescent Filler lies within the pen itself and is easy to fill and use. The Twain pen is made with a two-tone flexible nib for duo-tipped writing. Available in four different nub styles: Broad, Fine, Medium, and Stub. Each pen in the series carries the signature of Mark Twain on its band. Yes, you can view an ad from 1903 for the original Conklin Crescent fountain pen, touted as "The pen that fills itself." The advertisement contains an endorsement in quote by Twain and signature of S. L. Clemens. Read why he calls it the "profanity-saver!" In reading the ad I was delighted to discover that The Conklin Pen Company is located in my birth state of Ohio – Sweet treat! 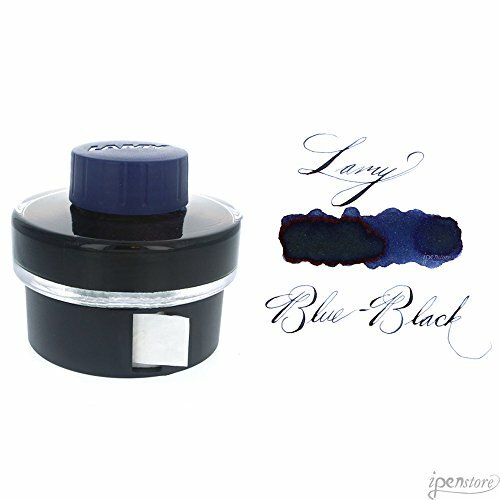 Add a touch of midnight blue to the flow of black ink in your ghostly or ghastly writings for Halloween. I do believe and I hope to make a believer out of you, too! 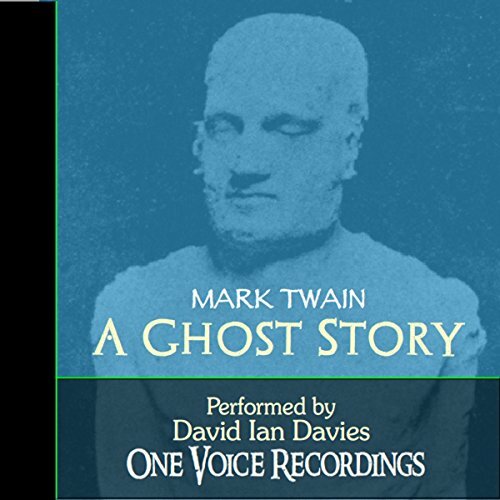 If you have ever read A Ghost Story by Mark Twain then you will realize the remarkable difference a pen makes in an author’s storytelling life. 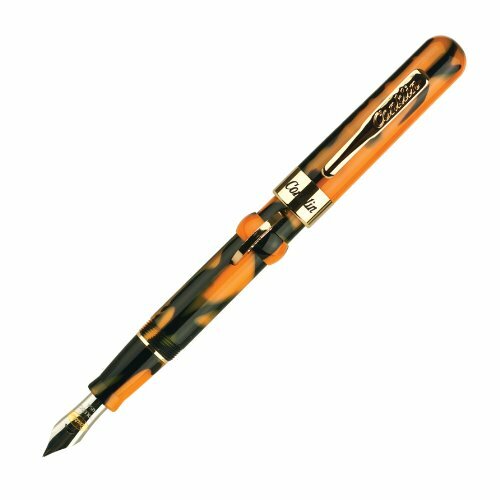 Yes, you and I can write a masterpiece of our own with the Twain Halloween pen in hand! I quickly stashed the bag of treats I had gleaned from my early evening hour of trick-or-treating along the hallowed streets of the neighborhood. Unlike the wee ghosts, goblins, and ghouls who now drooled over their goodie piles in the light of their family living rooms, my friends and I were unsatisfied with half of a Halloween. We wanted the tricks as well as the treats of the night. In reality, we wanted to be the tricksters and it mattered not to us that the homeowners we picked to trick had been generous with us earlier that eve. We carried their street names and house numbers in our heads and the tools for our mischievous shenanigans wrapped in our hobo kerchieves. Elm Street, 113, we toilet-papered the trees; Oak Avenue, 205, the black cat barely made it off the porch alive as we tossed week-old eggs her way; and, at 406 Pine Place, we smashed each jack-o-lantern face to smithereens our amusement to glean. We left no flowerpot unturned and flipped all hanging baskets upside-down. We were practicing pranksters, juvenile delinquents acting as if we were in training to join the ranks of gangsters, and we lurched from street to street in search of house after house to douse with our pranks. Hell-bent on torment we targeted the elderly, specifically little old ladies that we knew lived alone and would need aid in straightening up the messes we’d made. We moved all their furniture off their front porches and hid it down the street in the bushes. Yes. We had the nerve to go back the next day to volunteer — for a fee — to come to their aid, undoing the deeds we had done. These shenanigans stuck with me in my head and heart long after my hooligan days were a thing of the past. To this day I do not decorate the front of my home for Halloween. It’s as though I live in fear of the night of the year when the unhallowed hoodlums would be at my door to taunt and to haunt me as I had done to others on a past Halloween. 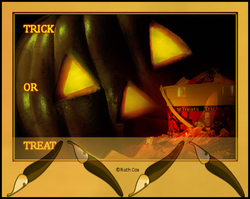 Do unto others … Trick or treat? 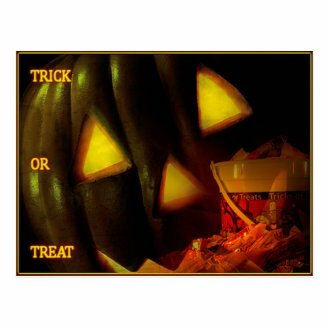 While you can not sail away with my Halloween tale (copyright applies all rights reserved to Ruth Cox) you can purchase my picture postcard treat to send to a friend or to mail to a family member. But of course, I suggest you use your new Conklin Mark Twain Crescent Fountain Pen to write your hallowed message upon the card. A writer must believe in the power of the pen! Have I made a believer out of you? Nancy, not a thing sad about the treasures you write online as opposed to with a fountain pen. I've noticed my handwriting gets sloppier with time and more keyboard writing than handwriting the old-fashioned way. I haven't seen a good fountain pen in years. What a treasure this is. Too sad that I can no longer do handwritten pages, but am relegated to composing online. But I loved your story. Well done!! You get no argument from me. Ink dripping from the tip of the pen across the blank paper page even sounds a bit gory! Perfect for the mystery writer, this ghastly pen is the right way to celebrate Halloween. For some odd reason I find that my handwriting is better with a quality pen. That said, it doesn't mean that the perfect pen will keep me from writing a ghastly story, ha! I do like a really good quality pen and my hubby does even more so. I loved when you said "..your ghostly or ghastly writings ..." That tickled me somehow lol! Yes, Telesto, I like fountain pens too and the Conklin Twain collection of pens are beauties. I love a fountain pen too! And I like the look of these ones. I so enjoy it when I use my fountain pen, Claudia, and really need to do so more often. Probably more importantly, I need to use hand writing more frequently. Computer use seems to have replaced writing by hand. Oh, do have fun removing the toilet tissue from your trees! Delighted to know you enjoyed my (true) story. It has been so long time since I've used a fountain pen...I love that you can still get one. I do love your story as well, looking forward to the toilet paper streaming from the trees on our street soon! We have the strongest persons who are not afraid of ghosts and demons but scared of scary clown faces.